As a chef and cooking instructor I have a front row view of how many people feed themselves and prepare their food. It is very interesting to see the many different philosophies that are practiced but quite often, the most common theory I see (particularly in younger diners) is that what you eat and how it is prepared really doesn’t matter very much, as long as it tastes good. Without any evident health concerns a frightening majority of our population thinks that they can eat what they want whenever and however they want it. “If it isn’t broken, don’t fix it” tends to be the theory many people practice when they make decisions regarding their personal eating habits. In addition to being a chef I am also a mother. I want my children to not only feel good and look healthy; I also want their brains functioning at their maximum ability as they go to school and complete their tasks. What if little decisions like what you drank with breakfast (or even if you had breakfast) could totally change how your brain worked for the first three hours of school each morning? Would you think a little more seriously about whether you opened a can of your favorite cola or poured a glass of water? You know how sleepy and tired you get in that class after lunch each afternoon… there is actually a reason. The next time you have that painful urge to close your eyes for just a few minutes (but are caught and embarrassed by your teacher) I bet you will wish you had made a few decisions differently at lunch that day. Every day of our lives, most of us ride around in a very complex machine with four wheels and a motor. Even though we may not be mechanics we know- you need to put unleaded gas in the fuel tank, oil in the oil tank, and air in the tires. If you decide you are in a hurry and don’t have time to stop at a gas station you cannot casually decide to just substitute water or some other liquid for the gas. Your car is going to protest, you can ruin the engine. In addition to the fact that you need fuel, the actual quality of the fuel also matters. Most people who have been driving for a while have a story about the time they ended up with “bad gas” and had to deal with engine trouble. I once accidentally pumped regular gas into a diesel engine… it was “good” gas, but that engine needed diesel and would not even START. If you have your own car, or a dreaming of soon owing one I’m willing to bet that you are convicted to take very good care of it. Cars are EXPENSIVE and important. Not having one available can mean that you cannot go where you want to go, hang out with your friends, get to work (to pay for that car), and maintain your busy schedule. Owning a car is a huge investment in a thing that requires care, specific input, and upkeep. You want your vehicle to last as many years as possible. Especially since there are so many little things that can go wrong, so many functions that are necessary like spinning wheels, cool air conditioning, tunes on the radio, and functioning breaks (just to name a few). Even if you don’t have a vehicle; you do have a means of transport that requires regular fueling. And unlike with an automobile… you aren’t going to be able to trade this one it in or sell it if things start to decline, you simply cannot buy another. If you think the engine under a hood is complicated you should just see all of the things that this system can do. It grows, thinks, maintains a constant temperature, gets you around, and does a few million other things every day of your life. Shouldn’t you take a moment to think about what sort of fuel you are putting in your body and what it is going to do for your performance, today and for the rest of your life? FAN is hosting this year’s Planetary Lander Egg Drop Competition (PLEDC). The competition will be held Saturday, April 30th at the Kennedy Space Center. Students from Florida afterschool programs are encouraged to participate. Please visit http://planetarylander.blogspot.com/ for more information and to register your team! Launched in October 2000, Lights On Afterschool is the only nationwide event celebrating afterschool programs and their important role in the lives of children, families and communities. The effort has become a hallmark of the afterschool movement and generates tons of media each year. There are hundreds of events planned in Florida to celebrate afterschool. Lights on Afterschool will be celebrated nationally on Thursday, October 22nd and in support of activities throughout the state, Governor Rick Scott issued a proclamation designating the day, as Lights On Afterschool Day in Florida! Please download the Lights on Afterschool Day Proclamation which can be displayed and/or read aloud at recognition events in your communities. My name is Alexis Walker and through the AmeriCorps VISTA program, and thanks to the Afterschool Alliance, I have recently become the newest staff member of the Florida Afterschool Network (FAN). For one year I will be working with the FAN STEM collaboration at the Astronaut Memorial Foundation. I am so honored to be in this position. When I was in grade school the need for STEM education was just being realized. Without appropriate exposure, I was intimated by STEM disciplines. I regarded them as static, unimaginative, and difficult. Thankfully, through later experiences I realized that STEM represents dynamic, creative and approachable fields that are for everyone. Now, I am excited to turn my focus towards exposing today’s youth to STEM through afterschool and summer learning programs. I believe that by introducing kids to a vibrant STEM curriculum and community, we can peak their interest, boost their confidence and help them unlock vast opportunities. CIS Summer Camps of 2015! For most students, summer is a much needed time off from school, a chance to relax and rest after 180 days of classes and homework. Unfortunately, summer is also the time where students are most likely to fall behind and lose the knowledge they worked so hard to gain during the school year. According to a study done by the National Summer Learning Association, most students lose about two months of grade level equivalency in math skills over the summer months, and low-income students tend to lose more than two months in reading achievement. This phenomenon, known as the summer slide, can be detrimental to students and their education. That’s where local non-profit Communities In Schools of Jacksonville (CIS) comes in. Throughout the school year, CIS works directly in schools to help students grow and stay on track. 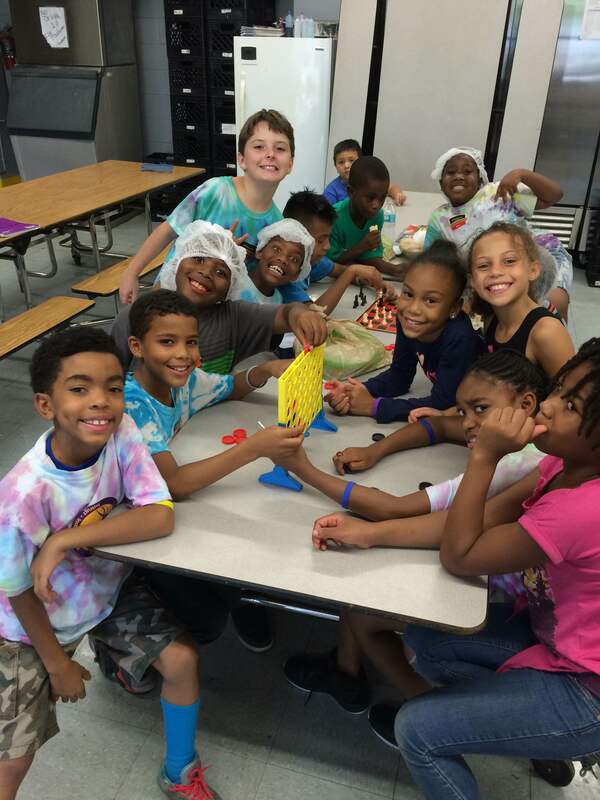 During the summer, CIS hosts camps at 24 different Duval County Public schools locations, encouraging and enabling students to take advantage of the summer months at no extra cost to them or their families. This year’s camps were top-notch, providing the educational enrichment needed to keep the kids on track as well as exposing them to amazing experiences. CIS also hosted two S.T.E.M. 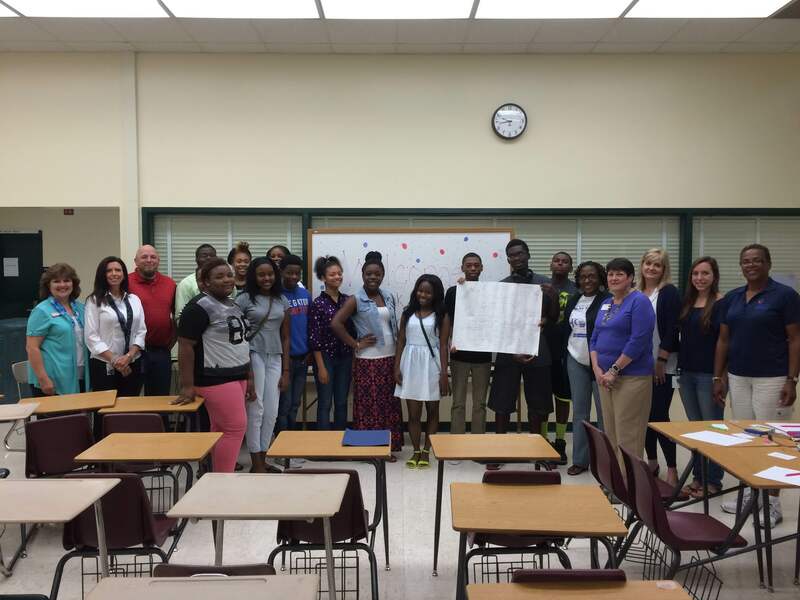 camps, one at A. Philip Randolph Academies of Technology and another at Ed White High School. The Bank of America Charitable Foundation awarded CIS with a $12,000 grant, making both of these camps possible. These ten day camps served approximately forty kids at each site and provided them with math, science, and general enrichment. Students at both sites had access to resources from NAVAIR, the St. Johns Riverkeeper, and Jacksonville University. The students also went on tours of manufacturing facilities, so they could see what they were learning in action. The highlight of these two camps was a visit from Bank of America representatives in the Women in Technology program to A. Philip Randolph. The representatives guided students in a collaborative activity where they formed groups and were tasked with creating their ideal city of the future. Each group listed what they wanted to include and then put their ideas on paper, drawing an overhead view of the city. The groups were then judged by their peers and the Bank of America representatives to determine who had created the best city. 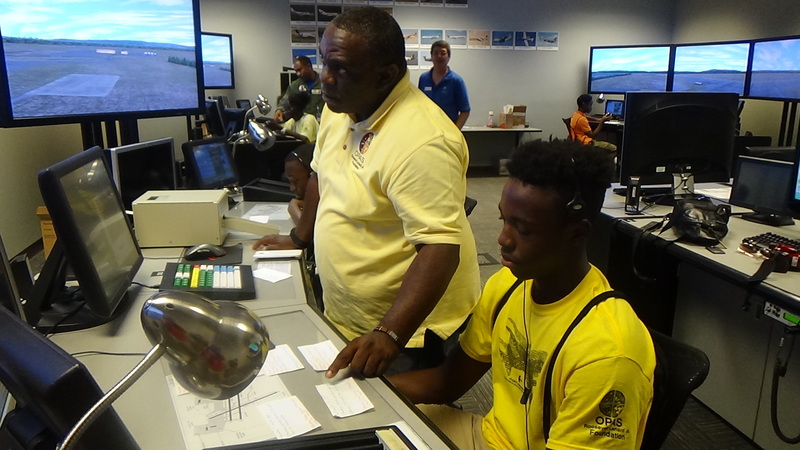 At the final camp location, Ribault Senior High School, 32 students participated in the Aviation Career Education (ACE) camp. This one week camp was packed full of incredible instruction and activity for its students. On Monday, the students visited UNF where they engaged in classroom instruction and used the Zip Line; the following day, they visited Florida Air National Guard (FANG) where they were able to see bomb gear, fire and rescue trucks, etc. Wednesday morning, they visited Hillard where Air Traffic Control Tower professionals provided the students with an extensive job shadowing tour. The following day, students visited the Jacksonville Airport where they went on a behind the scenes tour for personnel, luggage, operations, and security. On Friday, the students visited Cecil Air Fields and the FSCJ Center where they worked with ATC simulators (flying a plane-like experience), took a tour of the US Customs’ planes, and visited the hangers where they could see how planes are repaired. This exciting week culminated in Saturday’s events where the students visited Craig Executive Airport and participated in an orientation flight in a Cessna style plane, alongside a certified pilot. This nationally recognized program offered students an introduction to the aviation industry and careers, while simultaneously providing them with a once in a lifetime experience. Whether students wanted to design futuristic cities, fly planes, or simply keep up with their education, Communities In Schools of Jacksonville was their to provide those opportunities. With the gracious help of sponsors and funders, CIS was able to host 24 successful summer camps, helping to deter the effects of the summer slide and encourage students to make the most of their summers. When I was a PTA president, a motivated 5th grade teacher and I started an after school chess club in an elementary school. From that experience, I took away an immediate understanding of the power of chess to unleash talented minds, particularly for those students where the expectations for excellence were sadly based upon preconceived notions of what it takes to play chess, vis-à-vis their academic performance measured by traditional testing. The other take-away from that experience was that we could never reach all the students we needed to because after school chess clubs in Florida have three major problems. First, and foremost, clubs held after the school day are often exclusionary. Only those students with support structure resources independent of the school system are even able to participate. Foregoing bus rides and arranged transportation is clearly not an option for far too many students. Second, many after school chess clubs structured their “enrollment” based upon those preconceived notions that chess is best suited for those who have demonstrated laudable academic performance through testing and classroom performance. Anecdotally, in my experience, we saw the most interesting gains amongst those who had not been performing well. Nonetheless, limiting the after school club to gifted or certain segments of the student population denied access to those who may benefit the most from the positive impacts of chess and the afterschool experience. Third, for the vast majority of after school chess clubs, the club was always one person away from extinction. When the adviser had a conflict or moved on, or the principal had different priorities, few would step forward to take over in part due to the mystique of chess. After being elected Mayor, I donated twenty chess sets to each of the eleven public schools in Sunrise to encourage them to initiate a chess club. Many encountered the very challenges I faced back in my PTA days. From that, I set out to develop a scholastic chess culture which extended beyond after school clubs and beyond the four corners of the “schoolhouse.” With the astounding financial assistance of America’s Foundation for Chess and our Police Department, and enthusiastic support from three schools, we launched in Sunrise a pilot program to introduce chess in the classroom curriculum for every second and third grader. The pilot program was so successful that, within months, the School Board of Broward County, which is the sixth largest in the United States, expanded the curriculum-based “First Move” program to all elementary schools. As a result, this past academic year, an estimated 30,000 second and third graders learned chess in the classroom; the multiplier effect extended to siblings, younger and older, and family members. Then, working with the National Scholastic Chess Foundation, we developed an innovative model to educate community mentors on how to teach and support scholastic chess. We wanted to expand chess beyond second and third graders and tackle the problem that the afterschool clubs were one person away from extinction by developing chess advisors throughout the community. Their workshop program, “Demystifying Chess” is now approaching 200 trained teachers, principals, parents, police officers, elected officials, park and rec staff, parents, afterschool providers, Broward CSC providers, summer camp providers and mentors. The goal was not to develop student tournament or trophy winners, but to developed critical thinking skills, academic gains and new social skills. Many teachers are now incorporating chess into the classroom lessons. From this experience, we also developed a “template” for cities to start their own programs, which has even led to the mayors in Broward County sponsoring monthly county-wide fun chess events. Paradoxically, through this process of expanding chess outside the “schoolhouse”, the afterschool clubs have become stronger, more sustainable and are in greater demand. Now, one of our next steps is to make sure every child has the opportunity to participate in afterschool chess clubs. That’s why the Florida Afterschool Network’s mission of overcoming the barriers for students and families to achieve the most from the educational experience through robust afterschool programs, which meld the power of socialization with program opportunities meant to diversify the experiences for our students, is so crucial. Of course, my message is about chess, but we know this translates to the many other opportunities which paint the colorful tapestry of student achievement through a meaningful afterschool experience. For those of you who don’t know what Zero Robotics is……. Zero Robotics Middle School Summer Program is provided through a partnership between the MIT Space Systems Lab, the Innovation Learning Center, and the Massachusetts Afterschool Partnership (MAP) with support from Aurora Flight Sciences. The Zero Robotics Middle School Summer Program is sponsored by NASA, the Center for the Advancement of Science in Space (CASIS), and the Northrup Grumman Foundation. Zero Robotics provides educators with the necessary training and ongoing technical support needed to provide middle school students with an experiential learning opportunity in computer programming. Zero Robotics builds critical engineering skills, including problem solving, and teamwork. It connects students with prominent scientists and encourages them to pursue careers in the fields of science, technology, engineering and/or math. Student participants compete to win a technically challenging game by programming their strategies into the SPHERES. Students’ programs control the satellites’ speed, rotation, and direction of travel. The students program their satellites to complete competition objectives, for example navigating obstacles, while conserving resources such as fuel. The programs are autonomous – that is, the students are not able to directly control the satellites while they are running.